In late July I drove up to Wells, ME to meet up with some family that was staying there on vacation for the week. Most of my trips are based around photography and adventuring so it was nice to mix in some quality time as well on this one. The first night I was there we headed over to Ogunquit for dinner and after to Perkins Cove, a working harbor with restaurants, shops and the popular footbridge that needs to be raised when taller boats cruise in. A dramatic sunset wasn’t in the cards with a clear, so I focused on the line of dinghys and docked ships in the harbor for my compositions as the sun dipped below the horizon. The weather was very up & down the entire time I was up in Maine and the next day started off super foggy and rainy. We made our way over to York in the afternoon as the skies continued to open up off and on with some breaks between to enjoy the area and one of many lobster involved meals for the week. As we arrived in Cape Neddick the clouds began to fade away just in time to work on photographing the stunning Nubble Lighthouse, situated on a small island just off the coast where you can easily park and enjoy the amazing views. Having been here once before to shoot already I was trying to look at it from a different perspective and even got down on my belly to capture the reflection of the lighthouse in a puddle in front of me. The next morning my family was heading back to Connecticut so I decided to wake up at 3:30am and make my way up to Old Orchard Beach and attempt the iconic sunrise under the pier shot I’ve seen many times before. Quite an eery feeling walking up to this normally busy Summer destination and being one of only a few people there at this time of day. Was perfect situation for me with it being low tide and having these lines in the sand add so much texture the foreground of my composition. 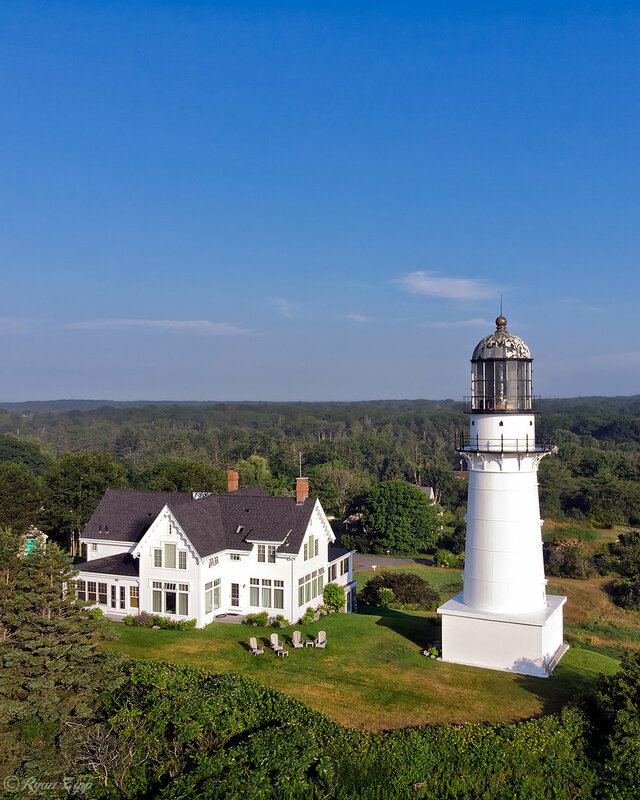 I then began to slowly make my way North up the coast, stopping at a number of lighthouses and state parks, including Cape Elizabeth Light, Portland Head Light, Spring Point Ledge Light and Reid State Park. In the early afternoon I made my up to Rockport where I would be staying for the night and checked into my room with some amazing views of West Penobscot Bay. Before heading out to a few more spots for the day I had to sample a lobster roll from Rockland, the “Lobster Capital of the World”, and went to Claws for their $50 one pounder! I can honestly say it was the best lobster roll of my life and top 5 meals of all time without hesitation. My next stop was driving to the top of Mt. Battie to get a panoramic view of surrounding lakes, forests and Camden Harbor from 800 feet above sea level. If you’ve seen Forrest Gump then you’d probably recognize my final stop of the day, Marshall Point Lighthouse, in the small fishing village of Port Clyde. This is the lighthouse where he ran to the end of the long wooden runway and then stopped before turning around to head back west. Had been hoping for some end of the day color but the Maine fog had followed me all day and made for some great moody shots of the lighthouse. I awoke the next morning to the sun and blue sky, so I rushed to get my day going and headed to Owls Head State Park. There were some incredible coastline views from here that I was able to capture as well as Owls Head Lighthouse and it’s ascending staircase. 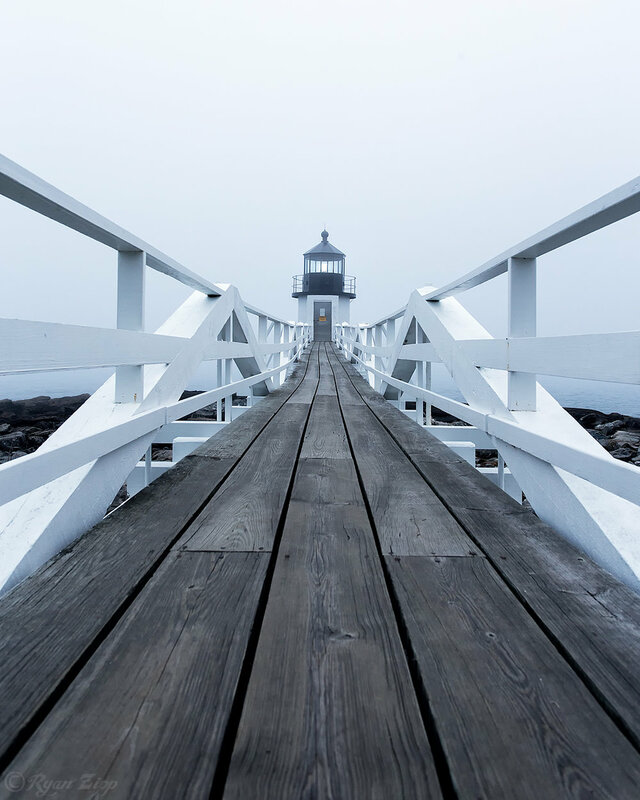 From there I continued the lighthouse theme of the trip over to Pemaquid Point Lighthouse to be once again greeted with zero visibility and grey moody vibes for some images before making my way to Booth Bay Harbor, where I would be staying for my last night in Maine. While checking into my hotel they filled me in on a few boat tours that they would be running that afternoon out into the harbor to view the coastline, seals & lighthouses that could only be seen by boat. Was nice to take a break from driving my car around for a bit so decided to head out and was able to capture some cool shots from the boat. Spent the remainder of the day adventuring around the Booth Bay area and then walking over to a local bar for dinner and few adult beverages while a good band played on the outside patio. For my last morning of the trip I woke up at 3:30am and headed over to First Landing in the small island town of Southport to be in position for sunrise. The nearly full moon was still in the sky as the scenery around me begin to glow from the rising sun behind my left shoulder. 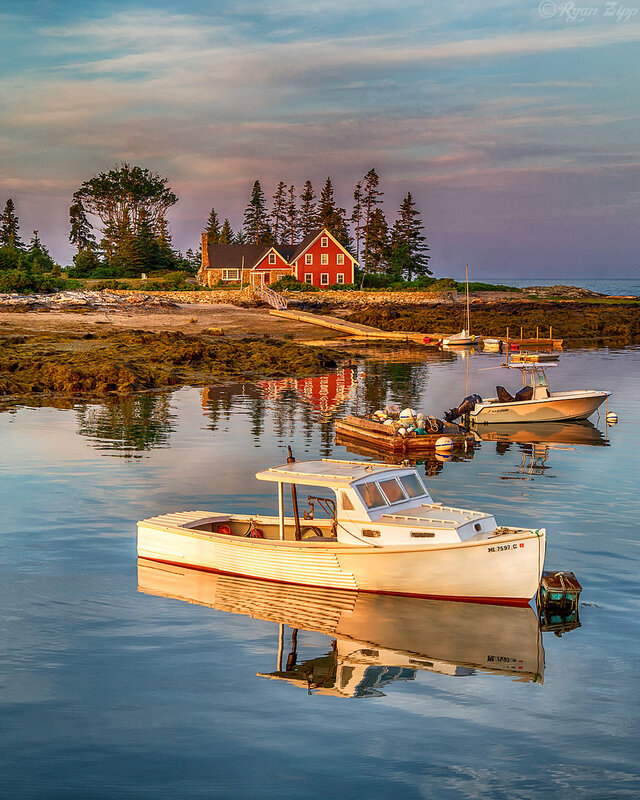 The water was so calm that I was able to capture the reflections of the boats in the water and even the red house sitting on the tiny 20 acre island behind them, just 900 feet from the mainland. I would later find out that this island and house had once been occupied by actress Margaret Hamilton who played The Wicked Witch of the West in the 1939 film “The Wizard of Oz”. Always great to learn more about these locations that I visit on my adventures, making the photos I bring home even more interesting. After checking out of my hotel I had one more lighthouse on my list to check out and made my way to Doubling Point Light in Arrowsic. Another beautiful lighthouse with a long wooden walkway leading out to it at the end of a windy narrow dirt road. At this point Mother Nature had decided to lift the clouds and give me a colorful backdrop once again to change up the mood of my images. Tired and hungry I knew it was time to hit up one more meal before beginning my journey south towards home, so of course I had to have some amazing fresh lobster one more time. Had read about Five Island Lobster Co. in Georgetown being a staple in the area and it happened to be nearby on my route so worked out perfectly. Sitting outside by the water watching the fisherman coming and going while enjoying an amazing lobster roll was the perfect ending to my Midcoast Maine adventure.